This project involved the preparation of a Detailed Physical Master Plan for the restoration and future development of several important sectors of Beirut Central District. The study area incorporates traditional market places, commercial streets as well as financial and banking centers. The vast majority of the built-up area covered by the study was old buildings of exceptional architectural and cultural value. 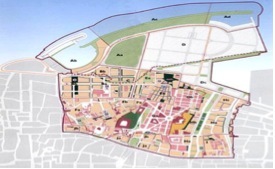 • Elaboration of general development master plan. • Development of proposals for street scapes as well as built-up forms and appearance. enhancements to facades, additions / omissions and amenity provisions. • Development of a 3D computer model of the study area.